Indo-Islamic architecture emerged in India under the Delhi Sultanate during the 13th to 16th centuries. The Delhi Sultanate refers to the five short-lived Muslim kingdoms of Turkic and Pashtun (Afghan) origin that ruled the territory of Delhi between 1206 and 1526 CE. The early rulers of the Delhi Sultanate are often viewed as iconoclastic pillagers, best known for their indiscriminate destruction of Hindu, Buddhist, and Jain temples and enacting prohibitions of anthropomorphic representations in art. The Delhi Sultanate’s greatest contribution to Indian fine arts , however, was the introduction of Islamic architectural features, including true domes and arches , and the integration of Indian and Islamic styles of architecture. Built by the first sultan of Delhi, the Qutb Minar is the tallest minaret in India, the walls of which are covered with Indian floral motifs and verses from the Quran. The Alai Darwaza is the main gateway on the southern side of the Quwwat-ul-Islam mosque in the Qutb complex; built in 1311 CE, it features the earliest surviving true dome in India. There is little architecture remaining from the Sayyid and Lodi periods, but a few fine examples survive in the Lodi Gardens in Delhi, including the tomb of Mohammad Shah, the last sultan of the Sayyid Dynasty , built in 1444.
corbel: A structural member jutting out of a wall to carry a superincumbent weight. iconoclastic: Characterized by attack on established beliefs or institutions. anthropomorphic: Having the form or attributes of a human. The Delhi Sultanate refers to the five short-lived Muslim kingdoms of Turkic and Pashtun (Afghan) origin that ruled the territory of Delhi between 1206 and 1526 CE. In the 16th century, the last of their line was overthrown by the Mughals, who established the the Mughal Empire in India. The early rulers of the Delhi Sultanate are often viewed as iconoclastic pillagers, best known for their indiscriminate destruction of Hindu, Buddhist, and Jain temples. They enacted Islamic prohibitions of anthropomorphic representations in art, which had been common at the time. However, the fusion of indigenous and Muslim customs and styles under the Delhi Sultanate gave rise to the beginnings of Indo-Islamic art and architecture, which reached its zenith in later years under the Mughal emperors. The Sultanate’s greatest contribution to the fine arts of India lies in their advances in architecture. 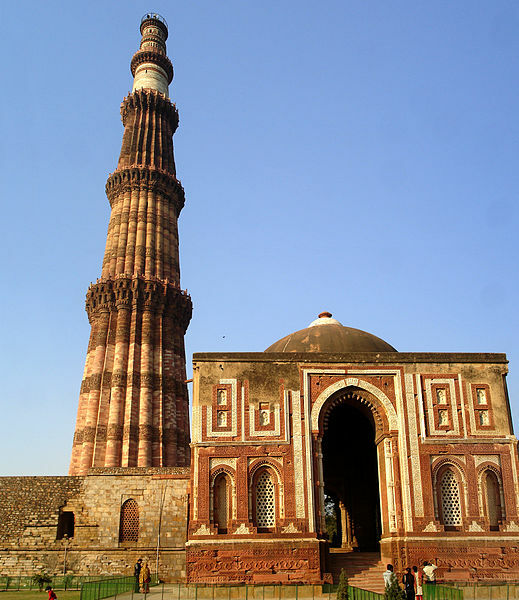 Qutb-ud-din Aibak, the governor of Delhi and, subsequently, the first sultan of the Delhi Sultanate (ruling from 1206–1210 CE), started the construction of the Qutb Minar in 1192, which was completed after his death by his successor Iltutmish. Made of fluted red sandstone and marble, the Qutb Minar is the tallest minaret in India, standing at a height of 238 feet. It comprises several superposed flanged and cylindrical shafts , separated by balconies supported by Muqarnas corbels (an architectural ornamentation reminiscent of stalactites employed in traditional Islamic and Persian architecture). The walls of the minaret are covered with Indian floral motifs and verses from the Quran. The Qutb Minar and the Alai Darwaza: One of the earliest and best known of the Delhi Sultanate architectural monuments, and also the tallest minaret in India. Its accompanying gateway, the Alai Darwaza, bears the first surviving true dome in India. The Qutb Minar is located in Mehrauli Archeological Park, which also contains other fine examples of Delhi Sultanate architecture, including the tomb of the sultan Balban (who reigned from 1266–1287 CE), the first known building in India to feature a true arch. Another building of historical importance in the development of Indo-Islamic architecture is the Alai Darwaza, the main gateway on the southern side of the Quwwat-ul-Islam mosque in the Qutb complex. Built in 1311 CE by the second Khilji sultan of Delhi, Ala-ud-din Khilji, it features the earliest surviving true dome in India. There is little architecture remaining from the Sayyid and Lodi periods, but a few fine examples survive in the Lodi Gardens in Delhi, including the tomb of Mohammad Shah, the last sultan of the Sayyid Dynasty, built in 1444. It is characterized by an octagonal main chamber with Islamic pointed arches, stone chhajjas (projecting eaves supported by carved brackets borrowed by Muslim empires from Hindu architecture), and guldastas (ornamental flower-shaped pinnacles) on the roof, both of which would eventually become common features of Mughal architecture. The paintings of the Delhi Sultanate represent a period of inventiveness and the development of an influential Indo-Persian style of art. Despite Islamic injunctions against anthropomorphic figures in art, the Delhi Sultanate patronized a vast cannon of painting and artistic work. The Delhi Sultanate developed an Indo-Persian style of painting that drew heavily from schools in Iran and Jain paintings. Features of Delhi Sultanate paintings that are based on Indian traditions include groups of people standing in rows and identical poses, narrow bands of decoration running across the width of the painting, and bright and unusual colors. The paintings of the Delhi Sultanate represent a period of inventiveness that set the stage for the development of the Mughal and Rajput schools of art, which thrived from the 16th to the 19th centuries. Jain: An ancient Indian religion belonging to the śramaṇa tradition and prescribing ahimsa (non-violence) toward all living beings to the most possible extent. Timurid: A dynasty of Turco-Mongol lineage descended from Timur, a 14th century conqueror who established empires in Central Asia and the Indian subcontinent. The early rulers of the Delhi Sultanate are often viewed as iconoclastic pillagers, best known for their indiscriminate destruction of Hindu, Buddhist, and Jain temples. They enacted prohibitions of anthropomorphic representations in art, which had been common at the time. Scholars previously believed that the Delhi Sultanate did not patronize painting because of this Islamic injunction against the portrayal of living beings in art; however, literary evidence and the discovery of illustrated manuscripts from the period suggests otherwise. Indeed, royal painting workshops appear to have flourished under more liberal rulers. The painting style of the Delhi Sultanate borrowed heavily from the flourishing traditions of Islamic painting abroad, resulting in the development of an Indo-Persian style. This style was based essentially on the schools of Iran but influenced by the individual tastes of Indian rulers and local styles, including Jain styles of painting. It is now believed that numerous painters and architects were invited from foreign countries, and illustrated manuscripts, handily transported, must have been easily available. Features of Delhi Sultanate paintings that are based on Indian traditions include groups of people standing in rows and identical poses, narrow bands of decoration running across the width of the painting, and bright and unusual colors that replace the muted hues found in earlier Timurid paintings. The earliest known examples date from the 15th century, including a copy of the Shahnama, or Book of Kings, created under Lodi rule. This work of art bears a close relationship to contemporary Jain paintings. Other notable works include the Khamseh (“Quintet”) of Amir Khosrow of Delhi, a Bostan painted in Mandu, and a manuscript of the Ne’mat-nameh painted for a sultan of Malwa in the opening years of the 16th century. The illustrations of the Ne’mat-nameh manuscript are derived from the Turkmen style of Shiraz but show clear Indian features adapted from the local version of the western Indian style. Though the western Indian style was essentially conservative, it was not unfailingly so. It began to show signs of change over the years, most notably in two manuscripts from Mandu, a Kalpa-sutra and a Kalakacaryakatha of about 1439, and a Kalpa-sutra painted at Jaunpur in 1465. These works were done in the opulent manner of the 15th century, but for the first time the quality of the line is different, and the uncompromisingly abstract expression begins to make way for a more human and emotional mood. By the opening years of the 16th century, a new and vigorous style had come into being. Although derived from the western Indian style, it is clearly independent, full of the most vital energy, deeply felt, and profoundly moving. The earliest dated example is an Aranyaka Parva of the Mahabharata (1516), and among the finest are series illustrating the Bhagavata-Purana and the Caurapañcashika of Bilhana. A technically more refined variant of this style, preferring a fine line, meticulous ornamentation, and the pale, cool colors of Persian derivation, existed contemporaneously and is best illustrated by a manuscript of the ballad Candamyana by Mulla Daud (c. first half of the 16th century). The early 16th century thus appears to have been a period of inventiveness and set the stage for the development of the Mughal and Rajput schools, which thrived from the 16th to the 19th centuries. Rustam Kills the Turanian Hero Alkus with his Lance: Shahnama, Delhi Sultanate, c. 1450. This miniature comes from a manuscript made by an artist who was highly influenced by Jain art from western India. Both the intense palette and the depiction of figures differ from those found in other Islamic painting.